A gentle summit in the southwest corner of Garibaldi Provincial Park, across Mashiter Creek from the Mount Garibaldi massif. It's the highpoint of Paul Ridge. A gravel road runs along Paul Ridge to the Elfin Lakes shelter and passes just north of Round Mountain. 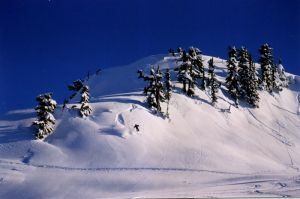 The open slopes on the north side are a popular day trip destination for backcountry skiers from Vancouver.